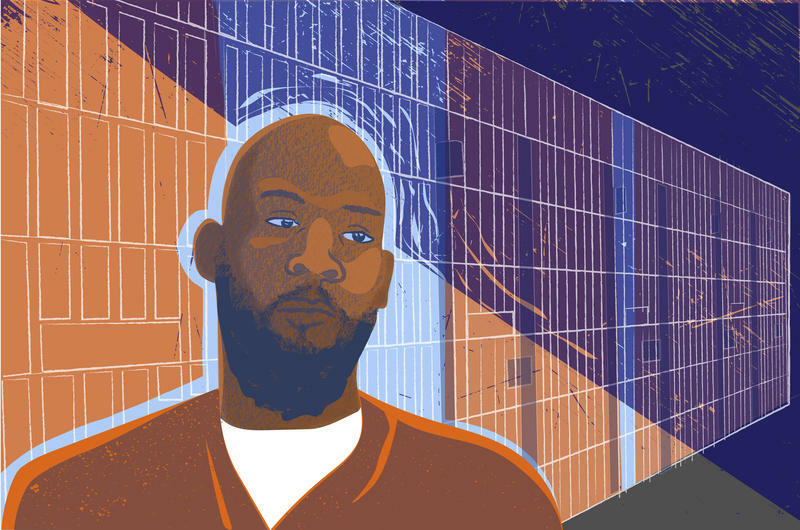 An illustration of Marcellus Williams, who received his second execution reprieve on Tuesday. Greitens announced the reprieve, Williams’ second, in a statement. "A sentence of death is the ultimate, permanent punishment. To carry out the death penalty, the people of Missouri must have confidence in the judgment of guilt. In light of new information, I am appointing a Board of Inquiry in this case,” he said. Williams’ attorney, Kent Gipson, said new DNA evidence showed that the DNA on the murder weapon wasn’t from Williams. "We're glad to finally get a chance to bring all this out into the open, and get a fair hearing on our claims," he told St. Louis Public Radio on Tuesday. "Apart from the DNA evidence, which I think is probably, in our opinion, enough by itself to warrant a new trial or commutation, there's a lot of evidence that's come to light over the years that casts the credibility of the two main witnesses into doubt." NAACP of Missouri President Rod Chapel said the decision will promote justice in the state. "Having a board of inquiry issued allows the opportunity for us as Missourians to ensure that justice is done, not only for Marcellus Williams, but also for everyone in the community," he said. Williams had been convicted in the 1998 fatal stabbing of Felicia Gayle, a former St. Louis Post-Dispatch reporter, and the state Supreme Court upheld that decision in 2003. Attorney General Josh Hawley and St. Louis County Prosecutor Bob McCulloch, who served as the prosecutor in the original case, both have said other evidence showed Williams was guilty. McCulloch said in a statement that he is "confident that any board and the governor, after a full review of all evidence and information, will reach the same conclusion reached by the jury and various courts." The board of inquiry will look at the new evidence and be able to subpoena people. It will issue a report to Greitens regarding its findings and recommend whether Williams' death sentence should be commuted to life in prison or whether he should be put to death. Former Gov. Mel Carnahan appointed the last two boards of inquiry, one for Theodore Boliek in 1997 and one for Lloyd Schlup in 1993. Boliek and Schlup both eventually were sentenced to life in prison. Twenty-three men are on death row in Missouri. Unless the last-minute requests for a reprieve are granted, a Missouri death-row inmate will be put to death Tuesday evening. Marcellus Williams, 48, was convicted in the 1998 fatal stabbing of Felicia Gayle, a former St. Louis Post-Dispatch reporter, at her University City home. In 2003, the state Supreme Court upheld Williams' conviction, saying there was sufficient evidence to support the jury's conclusion. His initial execution date was set for January 2015, but the state Supreme Court postponed it for DNA testing. Those tests were submitted to the court again last week as part of a request for a stay of execution. One of Williams’ attorney, Kent Gipson, said it showed the DNA on the murder weapon wasn’t from Williams. But the court rejected the request; the U.S. Supreme Court hadn’t weighed in as of 6 a.m. Tuesday. Greitens spokesman Parker Briden declined to comment on the request for a board of inquiry on Monday, adding there would be a statement Tuesday. Anti-death penalty rallies are planned in Jefferson City, Columbia, Springfield, Kansas City and St. Louis on Tuesday, as well as a vigil outside of the Eastern Reception, Diagnostic and Correctional Center in Bonne Terre, where the execution of Williams is set to take place. The state Department of Corrections has said it is “prepared to carry out” Williams’ execution. The department plans to use two of its 34 vials of the sedative pentobarbital. Missouri is one of four states that uses that method of lethal injection. The state protects the source of its pentobarbital, despite lawsuits from inmates and media outlets to force the state to reveal that information. Pentobarbital is made by one of two sources: A compounding pharmacy or an FDA-approved manufacturer. The manufacturer will not sell directly to any state for use in an execution and has made it clear it doesn’t want third-party distributors to do so. Williams would be the second person Missouri has executed in 2017; Mark Christeson was put to death on Jan. 30. Rachel Lippmann and Marshall Griffin contributed to this report.